Is this a uniform or a just bad habit? 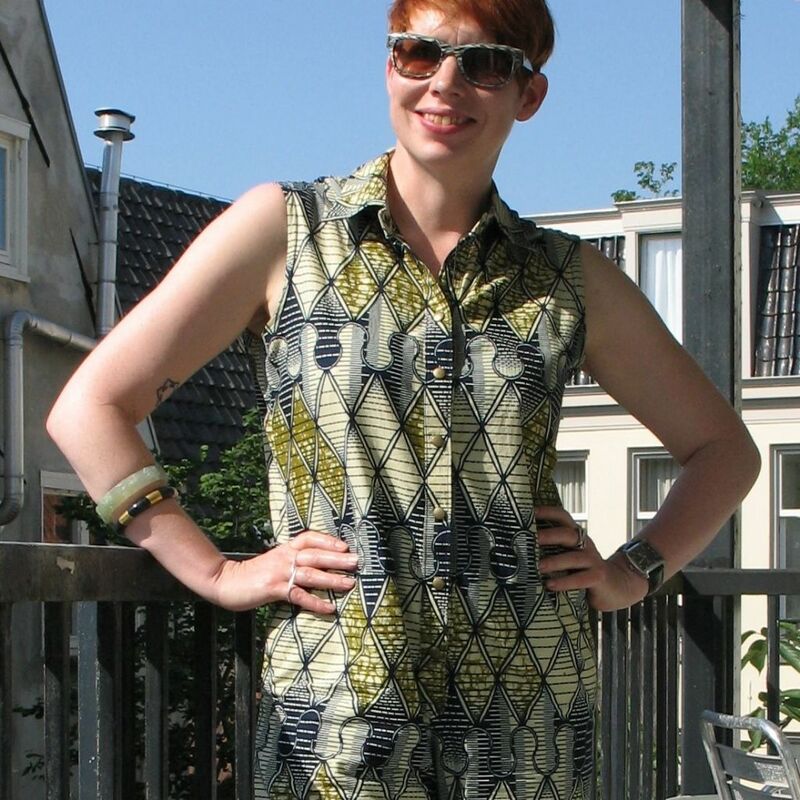 I made this jumpsuit out of Vlisco fabric, the classic Dutch wax print popular in West Africa. It's lovely to wear in hot weather, the need for an occasional swift exit notwithstanding. Did you know they're called jumpsuits for all those times you need to jump out of them quickly? Let's just say I'm glad I used snap fasteners and not buttons. Much as I love this garment, I tend to think these colours are a little "off" on me. The bold print in navy blue is very much in my wheelhouse, but the khaki and olive background is perhaps a little warm for my cool colouring. As I discovered from the lovely jackiec, once you dye your hair in opposition to your natural colouring, all bets are off. I've been experimenting with the Winter colour palette and reached the conclusion I'm probably a Deep masquerading as a Bright due to the red hair dye which I'm not willing to abandon. With this in mind, I'm hoping the effect of the red in my hair is enough to offset the cool and play nicely with the saturated olive in the print. And if I wear these sunnies with the brown lenses, maybe that intensifies the effect? Do the white sliders add enough of a cooling accent, or are they completely mismatched? Did I get away with it? Is this JFE? It's time to fess up to my guilty secret. My name is Rio and I'm a concert shirt addict. I have more of these things than their usefulness merits. At the last count, there are around 40 of these babies, choking up drawers and overflowing from the laundry bin. But I'll always find room for just one more. I can't seem to get enough of them. Some of them are over ten years old. The last one arrived only last week. I like to pretend that I'm supporting the artists but in truth the pursuit of another scalp has long since become an end in itself. No matter how much I'm enjoying the band there will always a part of me that's impatient for the music to stop so I can go check out the merchandise. But they're a useful basic, right? They're superior quality and nicer prints than you find in the shops. They're more likely to carry organic cotton and/or fair trade certification. And every one of them has a story to tell. Here's Patti Smith. She's touring her classic album "Horses" this year. If you love her, try and see her. I guarantee she'll make you cry. I'd swear up and down she was wearing Ann Demeulemeester, but who can tell at that distance? And here's Underworld, a band I'd been waiting to see for 20 years, and managed it twice this summer. Karl Hyde may wear nothing but Breton stripes but he did good by the fans. This is a beauty, a shirt for a connoisseur of tees. The silhouettes change but the formula remains the same. A bold print, a cute jacket, favourite pants and statement shoes. Instant cool. I'm off to do a presentation to an audience of academics this afternoon. I know a couple of them and by and large they are fairly casual, so I think more or less anything goes but I'd still like to make a positive impression. 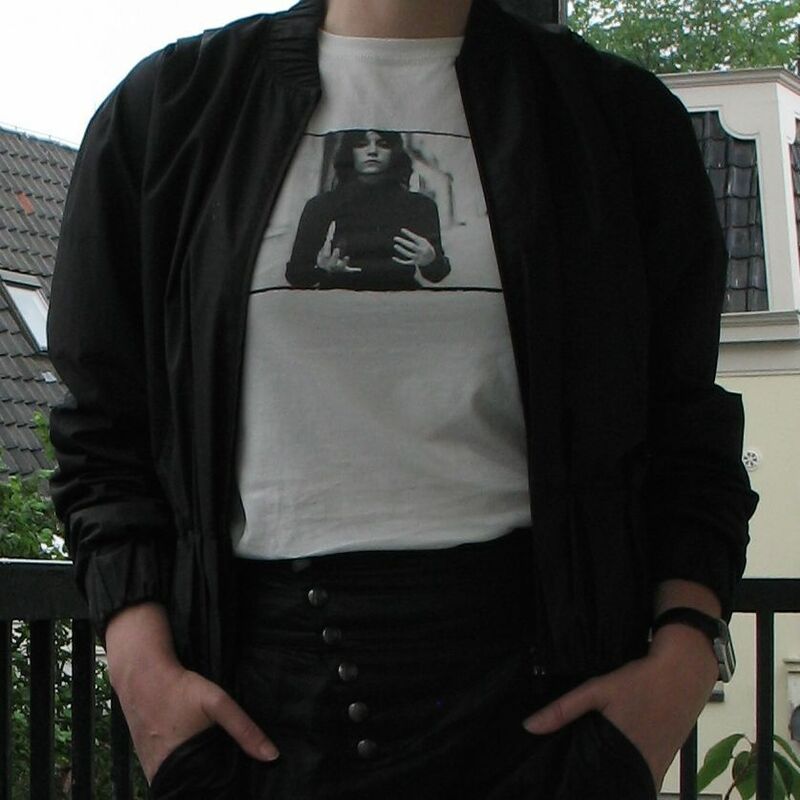 Here's what I'm wearing, but I can't decide on the shoes. The first pair feel very grounded and perhaps more appropriate to the audience. The second make me feel confident and maybe work better with the outfit. I'd be differently comfortable in either of them, so now it's up to you. Which do you prefer? Halp!